The thing that I appreciate most about summer is the beautiful light. I have been making the most of the last few weeks enjoying the fabulous scenery that is scattered with enchanting summer rays. It has got me thinking about different materials that play with light in a space, and I have gathered together some of my favourite examples of furnishings that have attractive reflective surfaces. I could never grow bored looking at the enchanting glass pear drops that hang from this table light. The ‘seeds’ that fall from this gorgeous chandelier almost look like raindrops, each one acting as a magnifying lens. These lovely large glass orbs reflect the light around them, and draw your attention in. Glass vessels that hold water are a beautiful table piece, and offer a playful refracted image of whatever they behold. Glass perfume bottles can be a charming ornament in the bedroom that twinkle in the last of the evening light. This brilliant wallpaper is a 3D foil that can be used to create great effects with some clever lighting. These contemporary arched mirrors create the illusion of an entrance, and will really open up a space. John Soane is famous for having used convex circular mirrors in his London town house to create a tour de l’oeil, magnifying viewpoints and making spaces look larger. 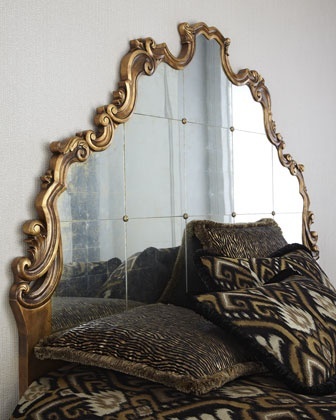 I love the glamorous ambiance created by using this antique mirror as a headboard. You can find some fantastic antique mirrors at Lassco. These garden tea light holders are lovely. The glass vessels emit a pretty flicker of candle light. Hanging Teardrop Votive by Garden Trading from Not on the high street. This gorgeous lantern creates a warm glow, perfect for a garden dinner party. Reflective materials and multi faceted surfaces can be a great way to play with light in a space; to create illusions of scale and splendour, or simply to make a room feel more dynamic. This blog first appeared on the Cambridge Evening News website.